This post that hopes to help us explore the province of Aklan, is dedicated to the promotion and discovery of the province tourist attractions. It also hopes to gather the right balance of information for an enjoyable online experience. WHERE IS THE PROVINCE OF AKLAN? The Province of Aklan has always been known for its pristine beauty which nature has bestowed upon it and its people. Home to Boracay Island, one of the world's best beaches famous for its sugar fine white sand, azure waters, magnificent coral reefs, and rare sea shells. Aside from the beaches, the fun and excitement of Boracay nightlife maintains its legendary status. Site of the Ati-atihan Festival. The "Queen of Philippine Festivals". Immerse in the province's man-made attractions. Head the calls of the Ati-atihan Festival and join the rhythmic dancing of the crowd who darken themselves with soot and don colorful tribal finery. Land of expert weavers and craftsmen. Aklan is the biggest producer of Piña Cloth, "The Queen of Philippine Fabrics". International trendsetters like Calvin Klein, Josie Natori, Donna Karan, and Valentino have used pineapple fabric in their collection. Aklan is a province of the Philippines in the Western Visayas Region. Its capital is Kalibo. It is in the northwest portion of Panay Island, bordering Antique Province to the southwest, and Capiz Province to the east. Aklan faces the Sibuyan Sea and Romblon Province to the north. Click here to know more about Aklan. 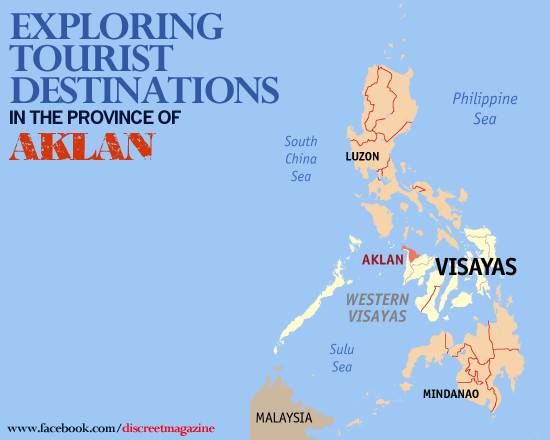 You have read this articleAklan / Aklan Tourist Destinations / Aklan Tourist Spots / Philippine Tourist Destinations / Philippine Tourist Spots with the title EXPLORING TOURIST DESTINATIONS IN AKLAN. You can bookmark this page URL https://thehalflifeoflinoleum.blogspot.com/2014/01/exploring-tourist-destinations-in-aklan.html. Thanks! Comments "EXPLORING TOURIST DESTINATIONS IN AKLAN"